Which coffee shop chain serves the tastiest coffee? When you next need a caffeine fix and you’re out on the high street, our coffee expert recommends you go to coffee chain Caffé Nero. In our snapshot taste test of high street coffee chains, our expert tested a small Americano and cappucino from Caffè Nero, Costa, M&S Cafè, Pret and Starbucks. Caffè Nero scored highest for both its coffees, with our expert praising the quality of coffee and depth of taste. Want to make great coffee at home? Which? members can find out more about our Best Buy coffee machines. If you’re not a member, sign up for £1 to access all our reviews. 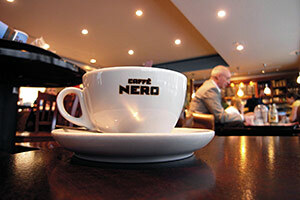 Caffè Nero offers two shots of espresso as standard in all of its coffees. So although they might cost you a bit more – we paid £2.05 for its Americano, compared to £1.95 at M&S Cafè – they’re worth it. Our expert Giles Hilton said the quality of the Nero Americano was excellent with a ‘rich smoothness you’d expect of a Central American coffee with an edge of spiciness indicative of an African coffee’, rating it nine out of ten. He also like the Costa Americano and praised the ‘smoothness and body’, scoring it seven out of ten. However, Pret did not impress. Its Americano was described as ‘plain, thin with too much water’ – and only scored three out of ten. Caffè Nero also topped the score board for its cappucino, scoring eight out of ten. Giles said it had the right balance between coffee and milk. He similarly liked the cappuccino from M&S Cafè, giving it a score of seven. Pret’s cappuccino only scored four. It was served with too much milk, which had been overheated and gave a caramelised flavour. Caffè Nero: Both the Americano (9) and cappuccino (8) scored well. Giles thought the balance of both was perfect, with the Americano offering ‘good body and density’ and the coffee taste really coming through in the cappuccino. Costa: While our expert liked the ‘smoothness and body’ of the Americano (7), he found the cappuccino (5) ‘too bitter with not enough milk to soften the taste’. M&S Cafè: Giles praised the creamy cappuccino (7), which had a good density of foam and said ‘it was a pleasure to drink’. He thought that the Americano (6) was a decent coffee but ‘it wouldn’t set your taste buds alight’. Pret a Manger: Our expert felt the cappuccino (4) was served with too much milk which had been over-heated by the steamer – giving a caramelised taste. He also thought the Americano (3) smelt of burnt charcoal and was served with too much water, maknig it taste ‘plain and thin’.